The Chevrolet Traverse is a seven-seat full-size crossover SUV built by General Motors. It is built on the same platform as the GMC Acadia and Buick Enclave (Lambda for first generation, C1XX for second generation). It is the successor to the Chevrolet TrailBlazer SUV and Uplander minivan. Originally marketed as a full-size crossover SUV, the Traverse was built at GM's Spring Hill, Tennessee assembly plant during 2009, but then production of the Traverse had moved to GM's Delta Township, Michigan assembly plant in 2010. 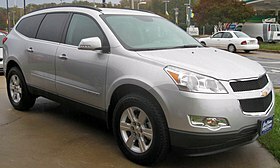 The 2009 Chevrolet Traverse debuted at the 2008 Chicago Auto Show and the Traverse had arrived at every Chevrolet dealer in October 2008. The second generation model debuted in showrooms in the summer of 2017. Starting with the 2019 model year, the Traverse was slotted above the new mid-size Chevrolet Blazer as part of Chevrolet’s plans to expand its CUV lineup. The Chevrolet Traverse features the LLT engine, a 3,564 cc (3.564 L; 217.5 cu in) DOHC V6 with VVT and direct injection. The other Lambda-based vehicles also have this powertrain in the 2009 model year. A 6-speed automatic transmission gives power to the front or all wheels. The Traverse delivers 281 hp (210 kW) with the torque at 266 lb·ft. in the LS and LT models. The LTZ model, with dual exhaust, delivers 288 hp (215 kW) and the torque comes in at 270 lb·ft. The Traverse name was originally used for a concept car at the 2003 North American International Auto Show in Detroit, but that concept gave way when the Chevrolet Equinox launched for the 2005 model year. The production Traverse's design was inspired by the 2005 Chevrolet Sequel concept, and has a chevron-shaped grille similar to the 2008 Chevrolet Malibu. The Traverse has unique sheet metal different from the other Lambda crossovers, with the exception of the doors. The Traverse was part of a product placement by GM in the NBC drama My Own Worst Enemy, along with the new Chevrolet Camaro; the show was cancelled in mid-November 2008. The vehicle also appears on the remake of Hawaii Five-0 and The Mentalist. The Traverse is also used in the Minnie Van Service in conjunction with Lyft at the Walt Disney World Resort in Florida. Gothic black colors of the Chevrolet Traverse are commonly used by federal agencies, such as Secret Service. On the LT models, the early 2010 update removed the "TRAVERSE" badges on the front doors. Beginning on late 2010 models, the GM logos were removed from the vehicle's front doors. A facelift of the Chevrolet Traverse was unveiled at the 2012 New York Auto Show. The 2013 Traverse receives a new grille and front fascia, a redesigned rear liftgate, and reworked Camaro-inspired tail lights, and the transmission has been reworked for improved shift quality and timing. Pictures were released by GM on March 28, 2012. Chevrolet's new color touch-screen and MyLink radios are standard, as well as wood interior trim. Both cloth and leather seating surfaces will be available, depending on the model. Cloth is standard on the LS and 1LT models, and leather is standard on the LTZ. Both are available on the 2LT model. Some new wheels will be available, and models will continue to be offered in both front wheel drive and all wheel drive versions, ranging from the base LS to the top-of-the-line LTZ. Base price for the 2013 Traverse LS is at $30,510. A Bose audio system will be standard on 2LT and LTZ models. While there were no cosmetic changes made for the 2014 model year, Chevrolet did add new features to the Traverse: Forward Collision Alert and Lane Departure Warning. Also, the audio system feature was updated, with a dual charge USB port now located at the rear of the center console. No cosmetic changes. Only two new features, a revised 18-inch wheel appearance and Siri Eyes Free, were added. Siren Red Tintcoat, Sable Metallic, and Blue Velvet Metallic became available as exterior colors, while Ebony/Saddle Up became available as an interior color option. The 2016 Traverse received minor changes. The trim level were reduced to LS, LT1, LT2, and LTZ. New features include OnStar 4G LTE connectivity with Wi-Fi hotspot, Iridescent Pearl and Mosaic Black Metallic as color palettes, Leather and Driver Confidence Packages for the LT trims, and 20-inch aluminum wheel designs, painted and machined finishes. For the 2017 model year, the Traverse LTZ trim is renamed to Premier. However, most of the features from the 2016 model year Traverse had been carried over to the 2017 Traverse models, which will be its last before becoming a fleet exclusive vehicle. Although the Traverse is redesigned for the 2018 model year, the previous Traverse model will still be available in 2018 as the Traverse Limited, and it will be sold to rental car companies and other fleets. 1 vehicle structure rated "Good"
On January 9, 2017, General Motors unveiled the second generation Traverse at the 2017 North American International Auto Show in Detroit. Introduced as a 2018 model, it went on sale in July 2017. While Chevrolet is making the vehicle available in North America, plans include expanding the Traverse to the Middle East, and selected South American countries. The Traverse was launched to the Russian market in 2018, and entered South Korea in April 2019 as a 2019 model. The updated Traverse abandoned the egg shaped design and now adopts a more truck-like design, similar to the Tahoe, while taking some cues from the now mid-size Acadia, with the Chevrolet front grille design. It is similar in dimension to the first generation model, adding an extra 2.0 inches of wheelbase and 0.7 inch more overall length, and it loses 111 pounds (50 kg) to come in at a weight of 4,362 pounds (1,979 kg). It remains an 8-seat (or 7-seat optional) passenger vehicle. As part of GM’s plans to expand its range of crossovers by size in order to be competitive within the segments, Chevrolet re-positioned the Traverse as a full-size (previously mid-size) crossover SUV this time around due to the launch of the mid-size Blazer that debuted in 2019. There are 5 trim levels available for the 2nd generation Traverse: L, LS, LT, Premier, and High Country (see below for trim level content). All the trim levels are available in either Front Wheel Drive (FWD) or All Wheel Drive (AWD) drive type configurations except for the L trim level which is only available in FWD and the High Country trim level which is only available in AWD. In an addition, there are 2 types of AWD system available for this generation of Traverse: the standard AWD system that allows user to disconnect the prop-shaft until rear traction is needed and the twin-clutch Twinster version (available only with High Country trim) with two rear clutches to more directly apply torque to the rear wheel that needs it most, both are developed by GKN Driveline. At introductory period, the new 310-horsepower 3.6L V6 gasoline engine will be the only available engine option, mated to a nine-speed automatic transmission with either Front Wheel Drive or All Wheel Drive. Additionally, a turbocharged four-cylinder engine will also become available in early 2018 with the introduction of the RS model. The new Traverse gains some new technology, some of which is currently available on other models such as the Chevrolet Equinox, Chevrolet Tahoe, and Chevrolet Suburban. Some of this technology includes: a hands-free power tailgate, the latest-generation Chevrolet MyLink infotainment systems with standard Apple CarPlay and Android Auto, a power-folding 60/40 split third-row rear bench seat, and standard keyless access with push-button start. L: The L is the least expensive trim level of the Traverse. It offers the following standard equipment: a 3.6L V6 gasoline engine with Stop-Start Technology, a nine-speed automatic transmission, a dual-outlet exhaust system, Traction Mode Select, StabiliTrak Electronic Stability and Traction Control System, dual frontal and front and rear SRS side-impact airbags, tire pressure monitoring system with Tire Fill Alert, OnStar, LATCH system for rear child safety seats, Teen Driver Technology, a rear vision camera, LED daytime running lamps, High-Intensity Discharge (HID) headlamps, black power-adjustable and manually-folding exterior side view mirrors, exterior color-keyed door handles, a seven-inch Chevrolet MyLink infotainment system with Apple CarPlay and Android Auto, Bluetooth with streaming audio, steering wheel-mounted audio system controls, six standard USB ports, a driver information center with a 3.5-inch monochrome display screen, a digital compass, keyless access with push-button start, a tri-zone automatic climate control system, interior lighting with theater dimming, premium cloth seating surfaces, eight-passenger seating, and ten standard cup holders. LS: The LS is the second least expensive trim level of the Traverse. It adds deep-tinted glass and optional AWD to the base L.
LT Cloth: The LT Cloth adds comfort and convenience features to the LS, such as: eighteen-inch Bright Silver-finished aluminum-alloy wheels, exterior color-keyed heated, power-adjustable, and manually-folding exterior side view mirrors, front fog lamps, roof rails, SiriusXM Satellite Radio, seven-passenger seating with second-row rear captain's chairs, an eight-way, power-adjustable front driver's bucket seat with power lumbar support, a three-spoke, leather-wrapped steering wheel, and power windows with front driver's express up/down and front passenger's express up functionality. LT Leather: The LT Leather adds luxury features to the LT Cloth, such as: Surround Vision with Bird's-Eye View, side blind zone and rear cross-traffic alert, rear park assist, twenty-inch machined aluminum-alloy wheels, an eight-inch Chevrolet MyLink infotainment system with GPS navigation, Apple CarPlay, and Android Auto, a ten-speaker Bose premium audio system, leather-trimmed seating surfaces, an enhanced driver information center with a 4.2-inch color display, a six-way, power-adjustable front passenger's bucket seat with power lumbar support, heated dual front bucket seats, a 120-volt AC rear power outlet, and HomeLink. Premier: The Premier is the "luxury" model of the Traverse, and adds the following features to the LT Leather: a dual-outlet exhaust system with rectangular exhaust tips, LED "D-Optic" projector-beam front headlamps, exterior color-keyed, power-adjustable, heated manually-folding exterior side view mirrors, exterior color-keyed body side molding with chrome inserts, chrome exterior door handles, twenty-inch Argent Metallic-finished aluminum-alloy wheels, a hands-free power tailgate with Chevrolet emblem projection, a driver's memory system, a power tilt-and-telescopic steering column, a heated leather-wrapped steering wheel, perforated leather-trimmed seating surfaces with heated and ventilated dual front bucket seats, heated second-row rear captain's chairs, and wireless charging for compatible devices. High Country: The High Country is the top-of-the-line Traverse trim level, and adds the following features to the Premier, such as: standard All Wheel Drive, a tow package, IntelliBeam automatic front high beam assist, forward collision warning and lane departure warning, adaptive cruise control with autonomous emergency braking, twenty-inch polished aluminum-alloy wheels, a SkyScape panoramic moonroof, and a power-folding third-row 60/40 split rear bench seat. RS: Based on the LT trim with leather seating adds black bowties, Black Ice grille and foglamp bezel, 20 inch Dark Android-painted aluminum wheels, Gloss Black window trims, and Black roof rails. The RS also has a turbocharged four-cylinder engine instead of the 3.6L V6 gasoline engine vs other trim levels. Redline Edition: Available on the Premier in the following exterior colors only (Iridescent Pearl Tricoat, Mosaic Black Metallic, Silver Ice Metallic, and Summit White), adds Driver Confidence II package, dual SkyScape panoramic moonroof, black-chromed mirrorcaps and door handles, 20 inch gloss black wheels with red stripes, black bowties with red and black badging, Black Ice grille and foglamp bezel, gloss black window trim, black roof rails, smoked dark tailamps, and black-painted lower moldings with black ice inserts. At time of introduction, the 2018 Chevrolet Traverse is available exclusively with a 3.6L V6 gasoline engine with Stop-Start technology, and a nine-speed automatic transmission. Future engine and transmission options (one of which includes a turbocharged four-cylinder engine) may become available for the Traverse in the future. The RS Model will also be available after introduction, based on one of the LT trim levels, as will a new Redline Edition based on the Premier trim level (see above for appearance package content). There were no major changes. The Saddle Brown Metallic color will be replaced by Havana Brown Metallic and the Roadside Assistance package is available on all trim levels. The Blackout Package is added as an available option on LS, LT, and Premier trim levels. The 2019 model year Traverse will also be the final year that the 2.0L I-4 LTG turbo engine is being offered for this vehicle. ^ "Chevrolet Traverse: Mid Size Crossover SUV". ^ "2009 Chevrolet Traverse" (Press release). GM. 2008-06-09. Retrieved 2009-10-16. ^ "2009 Chevrolet Traverse, with Enhanced Powertrain, Delivers Efficient, Responsive and Safe Driving Experience" (Press release). GM. February 6, 2008. ^ "2013 Chevrolet Traverse at the 2012 New York Auto Show - KickingTires". Blogs.cars.com. Retrieved 2012-04-09. ^ John Neff RSS feed. "2013 Chevy Traverse debuts with new face, minor tweaks". Autoblog.com. Retrieved 2012-04-09. ^ "2016 Chevrolet Traverse SUV AWD". National Highway Traffic Safety Administration. Retrieved 30 September 2015. ^ "2015 Chevrolet Traverse Large SUV / 2008 GMC Acadia SLE 4-door 4wd". IIHS. Retrieved 30 September 2015. ^ "Объявлены российские цены большого кроссовера Chevrolet Traverse". Wroom.ru. 4 April 2018. Retrieved 4 April 2018. ^ Priddle, Alisa (8 January 2017). "2018 CHEVROLET TRAVERSE FIRST LOOK: GOING FOR A TRUCKIER LOOK". Motortrend.com. MotorTrend Magazine. Retrieved 12 April 2018. ^ "GM Reports 221,983 Deliveries in December; 2,980,688 Vehicles Sold in 2008" (Press release). GM. 2009-01-05. Retrieved 2009-10-16. ^ "December 2010 Sales: General Motors - Cheers & Gears Forums". Cheersandgears.com. Retrieved 2011-01-04. ^ "GM U.S. Deliveries for December 2013" (PDF). General Motors. 2014-01-03. Retrieved 2014-01-13. Wikimedia Commons has media related to Chevrolet Traverse. This page was last edited on 22 April 2019, at 23:53 (UTC).